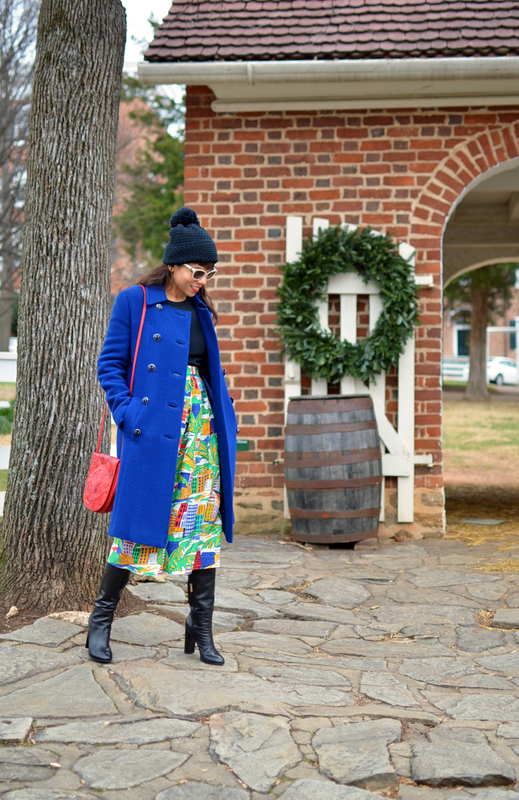 In my opinion, the first piece of clothing that most people notice on you during the cold months of the year is your coat, and with that in mind, I keep eye out for beautiful and fun pieces when I shop. 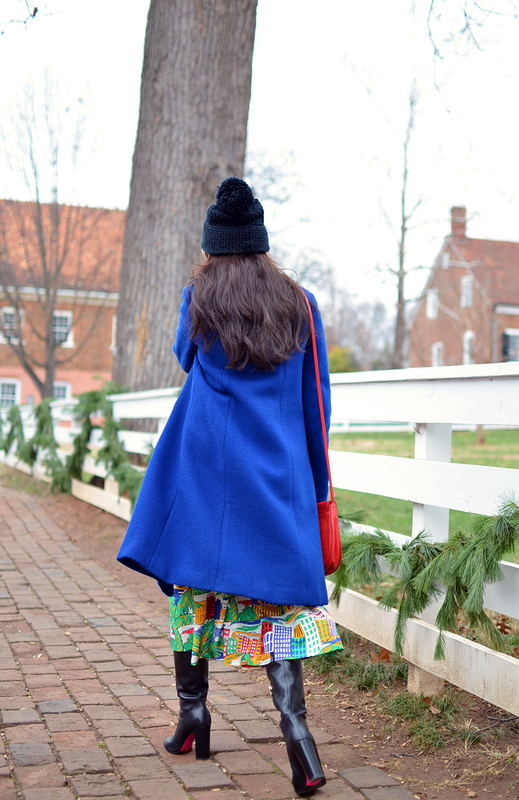 For example, this vintage coat immediately got my attention, due to its striking shade of blue, classic shape and impeccable craftsmanship. 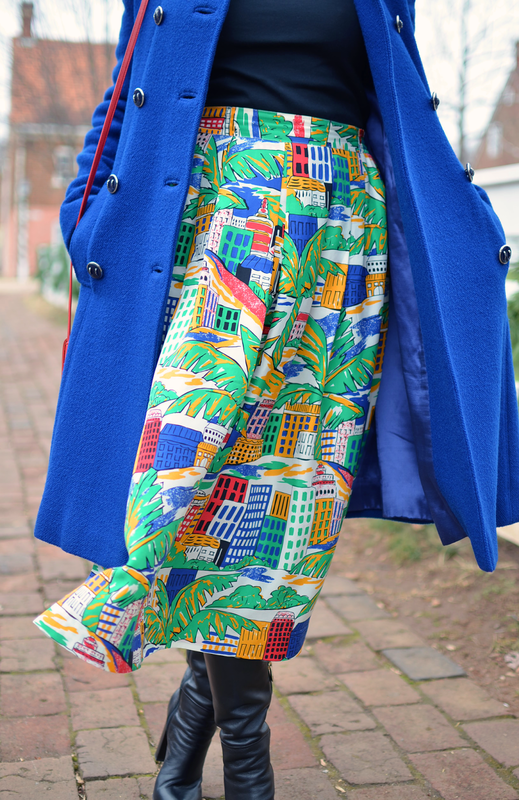 I was lucky to find this coat in a recent visit to Grand Rapids, MI at a wonderful vintage store called Lost & Found for a very reasonable price. 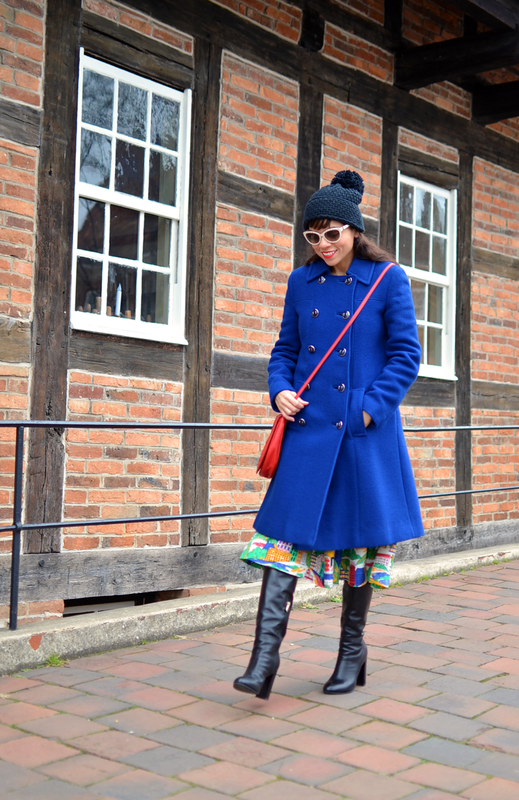 In this occasion, I decided to wear it with similar happy colors and a tropical printed skirt in order to brighten a such gloomy morning. En mi opinión, la primera pieza de ropa que la mayoría de la gente nota durante los meses friolentos del año es el abrigo, y con eso en mente, mantengo mis ojos abiertos en busca de abrigos hermosos y divertidos cuando voy de compras. Por ejemplo, este abrigo de vendimia inmediatamente me llamó la atención, debido a su sorprendente tono de azul, corte clásico y su confección impecable. Tuve la suerte de encontrar este abrigo en mi reciente visita a Grand Rapids, MI en una tienda vintage súper estupenda llamada Lost & Found por un precio muy razonable. En esta ocasión, decidí llevarlo con colores alegres y una falda con estampado tropical con el fin de alegrar esa mañana que estaba sombría y muy fría. YES! YES! 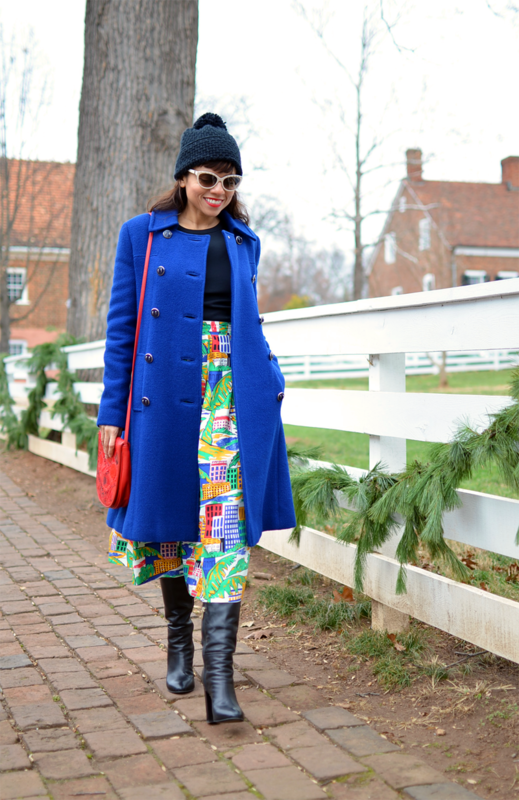 I love this look Carelia! Such a cheery mix of pattern and colour! 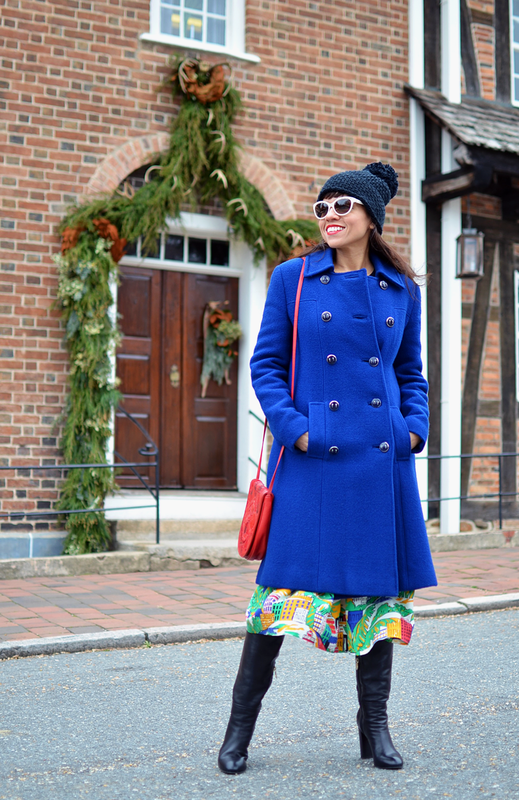 And the vintage coat is a great find! Love those bound buttonholes! PS - Only you could wear a Canadian style touque and look totally adorable in it! Thanks Nicolene! I'm sure you will find a fantastic pair. Oh this would brighten up any gloomy day! 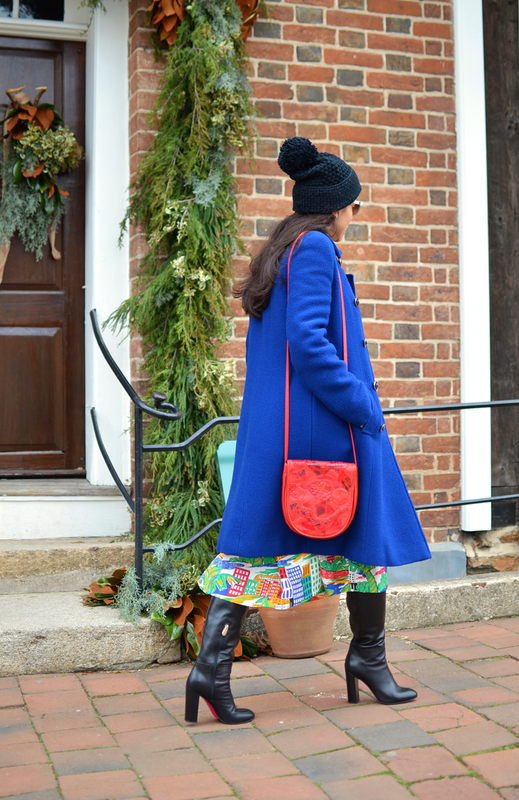 Gorgeous blue coat and such a happy, fun skirt - completely lovely together with your cool boots! Thanks Natalia! I'm glad you like this combo. I needed a happy combo to bright my day.